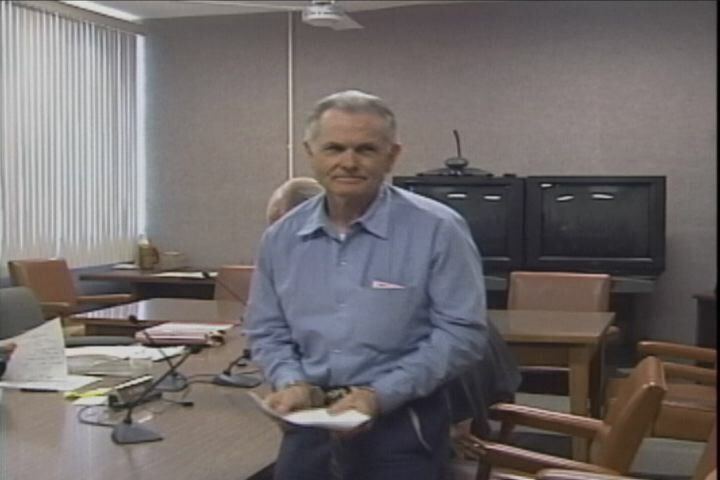 SAN LUIS OBISPO, Calif. -- Convicted killer and former Charles Manson follower, Bruce Davis may be released on parole. Davis' parole was granted back in October 2012, after 27 tries and 30 years in prison. He is still being held at California's Men Colony. Governor Jerry Brown has until Friday to decide if Davis will be released. Officials say Davis has been a role model prisoner completing all available educational, vocational and self help programs. This isn't the first time Davis has been issued parole. In January of 2010, Davis was recommended for parole but it was reversed by then Governor Arnold Schwarzenegger. Davis planned to move to Grover Beach and was once welcomed to volunteer at New Life Community Church in Pismo Beach but when Central Coast News reached out to the church today but they didn't want to comment. If freed, Davis will go to transitional housing affiliated with Los Angeles County religious groups. "They did issue a grant of parole to inmate, Bruce Davis, because of his positive adjustment, his record of no recent disciplinary problems and his successful completing academic and vocational education and self help programs," says California Department of Corrections and Rehabilitation Deputy Press Secretary Terry Thornton. Under California law, the governor may reverse, modify, affirm or decline to review the board's decision. Central Coast News reached out to Governor Jerry Brown's press office who said they won't comment until after the decision is made on Friday. If I were a betting woman, I'd be...s--t out of luck, because I really don't know which way this one's going to go. With the Governator, it was obvious. If he gets out, do you think it will be a quiet parole like Grogan's (and even Fromme's), or might he do some talking? This guy is genuinely inscrutable to me and always has been. This outcome is anyone's guess. I think it all boils down to how much pressure Brown receives from victim's advocates. I know letters have been written to the governor, requesting a veto. I think the impact of those factors, is the unpredictable element here. Who could possibly know, what's in Brown's head? But truth be told... I don't see how anyone could be 100% certain of this outcome either way. It's a complete crap shoot. Anyone who's says differently, is a bullshitter. I'll admit straight upfront, I have no idea how this is going to go down. I wouldn't even want to venture a prediction, other than to say, that Davis has a legitimate shot... (as in 50/50). But isn't that an indictment of the process itself that this is all coming down to a coin flip? Shouldn't the procedure be structured so that it isn't the same as a beauty contest where the whims of one or two people determine the outcome. How does one become self-motivated towards rehabilitation if they know at the end of the road it is just a crap shoot wether you get out or not. As Lynyrd has mentioned before, if Manson had died ten years ago this would be a no-brainer, and Leslie would probably be working as a hostess at the Olive Garden now too. Leary - Fair points all. Anyone willing to guess, how long before lapd gets the Tex tapes? I'm curious to know if Bruce was mentioned in them. "But isn't that an indictment of the process itself that this is all coming down to a coin flip? Shouldn't the procedure be structured so that it isn't the same as a beauty contest where the whims of one or two people determine the outcome". Michael Beckman (Bruce's attorney) explained that he disliked the governor review stage. He elaborated by saying, that the parole board review was an "in-person", "face-to-face" situation, whereby the panel had an opportunity to interface directly with the inmate. Whereas... the governor's decision was simply (as he put it) a "paper review". Beckman elaborated on the shortcomings of a "paper review" as he termed it... and, I tend to agree. What's the point of jumping through hoops for the parole board, if a governor can arbitrarily dash your dreams (and hard work). It doesn't sound like a very consistent system, when every inmate's destiny lies solely in the hands of one man. According to Sunset77, California is the only state which employs this "governor review" system. I don't know if that's true... but if it is... it's probably a good thing. "First, CA is the only state I know of that the governor has to approve decisions made by the parole board." I find myself quoting Sunset a lot lately. I did feel reading the last parole hearing the board were more than happy to approve him (bearing in mind they had approved him the previous time). I wonder how many times a parolee has been approved and denied? Perhaps if Davis is denied it could generate enough publicity to become a cause celebre for the parole board. They feel they do a decent and proper job but if their views are continuously ignored, what purpose do they serve? I think, as Lynyrd pointed out, the Governor will just ignore the recommendation and it will stand. That way no one can point a finger at him for any political reasons. Should he get out? My opinion is no. He has minimized his participation of Shorty's killing at parole hearings but yet in 1969 he was bragging his head off. I don't think that was due to drugs, I think it was due to the fact that he thought he was a badass. But after conviction he and Tex started a scam "religion" to make money and he just continued on with it. I don't care how many Masters Degrees he has attained. What else has he got to do? This "conversion" to me is just another act. I hope the Governor doesn't buy it. I think that brutality comes into play when you're talking about first degree murder, and this murder was maybe more brutal than all of the murders. Shorty was clubbed on the head from behind by Clem, then dragged out of the car and stabbed repeatedly. Some of the stab wounds were superficial and some were life threatening, but the thing that is most alarming is the stab wounds to the head. Stab wounds so hard that it penetrated the skull. Left holes in it. Most killers don't stab in the head. That's maniacal. When the parole board or the Governor makes a decision to release, in part in has to pay attention to brutality. One point of clarification, I said that CA is the only state "I know of" that the governor reviews parole decisions, there may be other states with this process as well, I'm just unaware of them. Finally, as of 10:17 Eastern Time, the California Department of Corrections and Rehabilitation website page "Inmate Locator" still lists a "Bruce Davis, CDCR #B41079, Age 70, Admission Date 4/21/1972 as an inmate at California Mens Colony (CMC). If or when that page is ever updated I don't know. There is a phone number listed to locate inmates, I'm not going to call it though, I'm going to bed. it's like those bars that offer free beer tomorrow on the menu. Hi Bobby! I'll be on the lookout. LOL. Well, if Bruce gets out, he won't just be living off the California residents anymore. He'll be living off all of us. Our taxes went up 2% this year because Bush isn't the President anymore. And that 2% will go towards supporting losers like Bruce Davis who can't/won't get a job. The tapes and the media onslaught by Debra Tate may what makes the difference in this case. One aspect of all these 40 year plus parole sentences is the extent to which they might be considered to constitute "cruel and unusual punishments’ (see 1689 Bill of Rights and 1791 Eighth Amendment) or ‘cruel, inhuman or degrading treatment or punishment’ as it is stated in the 1948 Universal Declaration of Human Rights (article 5). One might consider serving a sentence of 40 years in itself to be unusual, and it’s certainly not kind. But to offer the prospect of parole, however remote, for so long most certainly is. The "essential predicate" is "that a punishment must not by its severity be degrading to human dignity," especially torture. A severe punishment that is obviously inflicted in wholly arbitrary fashion." A severe punishment that is clearly and totally rejected throughout society. A severe punishment that is patently unnecessary." We can all form our own views as to this. Mine would include the feeling that a) there has been and continues to be something ‘arbitrary’ about parole decisions and b) to keep most of these people in for so long and at such an age is ‘patently unnecessary’. As always, just one person’s view. Starship said, The tapes and the media onslaught by Debra Tate may what makes the difference in this case. Insofar as she solicits members of the general public with pleas to write in to parole boards another interpretation of the media onslaught by Debra Tate might be incitement to deprive an individual of his right to liberty, though I fear this would not –for a number of reasons– constitute an offence under current US legislation. Frank, Thanks for the info on Brennan’s words. This meets two of the four requirements which to me seems like a tie. In base ball a tie goes to the runner. Who does the tie go to in this case ? That maybe how the arbitrary fashion comes into play. It's hard for me to see Bruce as being a victum of cruel and unusal punishment. He seems to have been in denial about his responsibility for a long time and only more recently professed a feeling of responsibility for his role. I do agree that at this point he could be let out without a being a risk I just don't think he has been in long enough to really be considered cruel in comparison to his crime. of course that is just how I see though. Bobby, remember he was sentenced 'with parole', and has perfect behaviour since 1980 I believe. That's thirty years of good behaviour - more than many murderers serve altogether. You say that you just don't think he has been in long enough to really be considered cruel in comparison to his crime. Just out of curiosity (no offence intended) how long do you think would be 'long enough'? I just received the press released, PAROLE DENIED !!! Frank, In a way that is like asking what is a life worth ? 30 years ? 40 ? Long enough is about now based on my understanding that it has really only been recent that he expressed that he truely realizes his culpability. My understanding has been that even though his record has been clean he has previous said things like I only poked the guy after he was dead etc. Now I could be wrong about that. All that said, I would be ok with his release. However I am uncomfortable with how long is long enough because of how it relates to the victum who has been permantly sentenced and even more thier families who permantly dont have their loved one. Permantly is too long for sure. I guess in some things of life I go more on "feelings" than logic. Certainly no offense taken Frank, I am happy you that you will converse with me so dont worry about offending me. Brian, thanks! I've been reading your stuff, and you've said all along you thought he'd be denied. Bobby, i feel the same. I have a hard time seeing any of the manson crew as victims. The sentences are life with the possibility of parole, not with parole. The gravity of his crimes can hold him for life. I go more on "feelings" than logic, says Bobby. In an ideal world, it would make no difference who you knew or didn’t know; who you had willingly or unwillingly [been] associated with; what kind of lawyer you could or couldn’t afford; who was currently State Governor; whether or not Debra Tate was on your case; well you get the idea. Hope to see you on the new post. Hi Brian. I wished I had been checking these comments instead of refreshing a Google search. I would have been informed 15 or 20 minutes before I was. Thanks for trying!